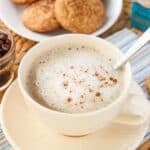 This nutty vanilla coconut latte features almond and vanilla flavors, is just sweet enough, and vegan! Brew espresso using your preferred method. Pour espresso into your mug. Add agave nectar to espresso and stir so it's mixed in. Add Almond Breeze almondmilk coconutmilk and 3-4 drops of almond extract to a milk frother (or to a cup if using a frothing wand). Froth. Pour milk into espresso and spoon frothed milk over top. Top with a dusting of cinnamon or cocoa powder.